Born and raised in Hawaii, Jocelyn grew up having a very active, healthy lifestyle. At the young age of 15, she was scouted by Tokyo’s top agency, and her professional modeling career took off. Since then she has traveled all over the world working and living in 12 different countries as an Actress, Model, MC and TV host and is currently signed to Bullet Films Productions. After a life-changing trip to Nepal in 2007 she & her husband decided to open a school for underprivileged children in Nepal so in 2008 they opened Moonlight Foundation Nepal. She has always been interested in health and wellness and helping people get healthy naturally so in 2010 she and her husband opened Lotus Centre Wellness, which is an all natural health company that believes that if you balance your body, mind and soul you can achieve your infinite potential in life. Jocelyn is a Certified Practitioner in: Millennium Method, NLP, Ericksonian Hypnosis, Yuen Method™ and Pilates. 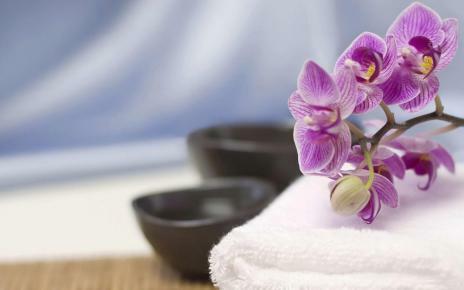 Most of us love massages but do we really know what the health benefits are other than that it relaxes us and make us feel good? I’m sure everyone that been to Thailand has had the pleasure to try at least 1 Thai Massage. I’ve tried so many I can’t even count. Some were amazing and some I just wanted them to be over. I know the difference between the good & bad massages were the therapists’ training, experience and passion that they bring to the massage. After trying Kay’s amazing Candlelight Restorative Yoga last week she told me she also does Thai Massage that is based on Yoga. Based on Yoga? That made me very curious so I asked her for more info. She told me that Thai Massage is a dynamic bodywork therapy based on yoga, Ayurveda and martial arts. This beautiful healing art was originated in the temples of Thailand 2,500 years ago. The philosophy behind Thai Massage is the focus on energy lines called “sen” lines. All the marma (pressure) points along the body are stimulated during the massage to relieve muscular tension, improve circulation, boosts immune system, and balance the body energetically. After hearing all of that I was excited to try her massage. As soon we started the massage a felt a wave of peacefulness wash over me. She started with “OM” and then her healing music took me into a deeper relaxation. I could feel the difference between her and all the other therapists. It was much more of a spiritual experience rather than just a massage. After the massage I was totally relaxed, at peace and felt healed and rejuvenated. I realized that taking an hour of the day to take care of “me” so that I could recharge my batteries and have a fresh start for the rest of the day and week is so important. Often times we are always rushing through life so fast that we miss living. I’m grateful to Kay for helping me slow down and appreciate life. This healing massage therapy is available at The Sanctuary with Kay Kavitha. Kay is a Yoga Teacher as well as a Thai Massage Therapist who has been trained in Thailand with The Thai Massage School of Chiang Mai and in the West with The Lotus Palm School. With lots of “Metta” (compassion and loving kindness), Kay offers the recipient a relaxing and restorative experience where one leaves with a happier and balanced state of mind.